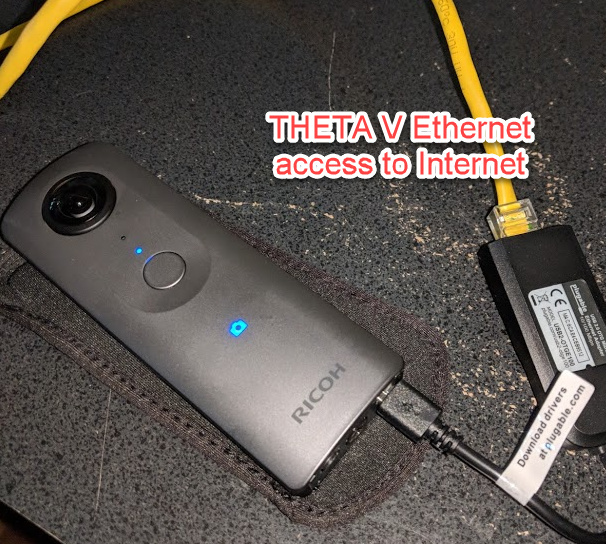 You can connect the THETA V to the Internet using Ethernet and common USB OTG adapters. 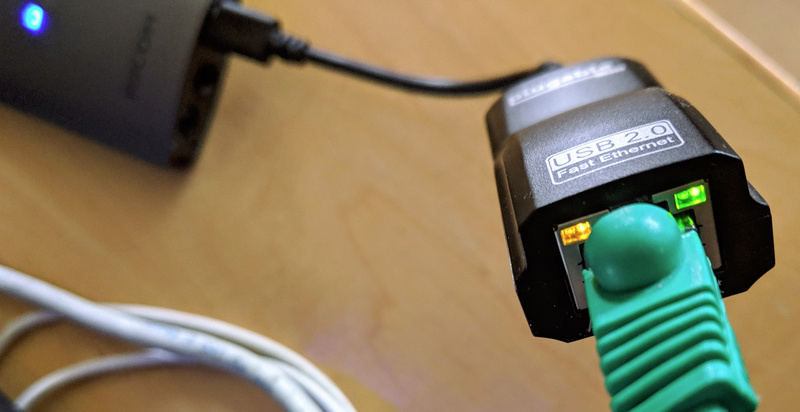 When you plug a USB OTG adapter into the THETA V, it will automatically get assigned an IP address from your router using DHCP. 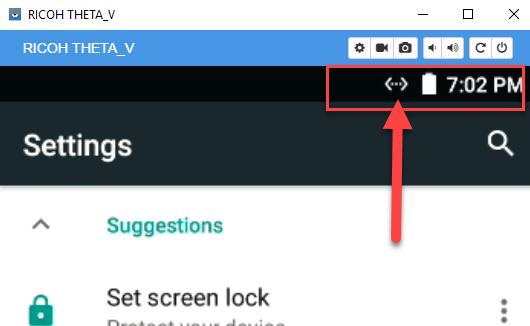 You can set a static IP in your router so that you know what IP address the THETA V is assigned. Although most USB OTG adapters should work, I tested the Plugable USB 2.0 OTG with ASIX AX88772A chipset. I can recommend it as it is cheap, $13.89 with free shipping and it worked immediately. 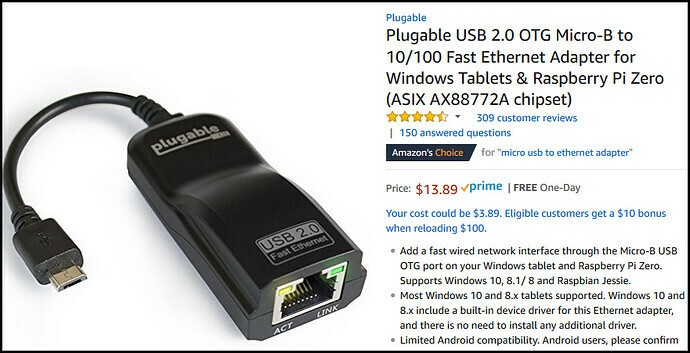 The adapter did not require any drivers or any other software. 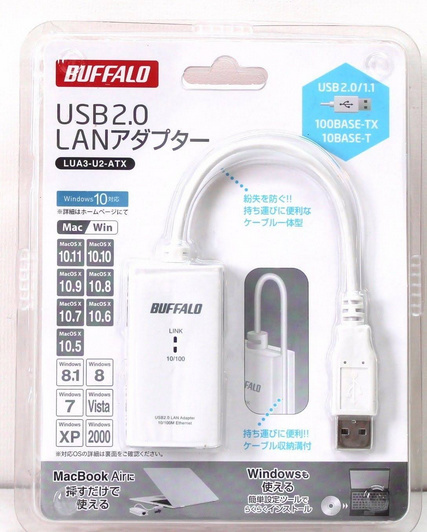 The MAC address is written on adapter. Most people will want to configure their router to match up the MAC address with the IP, then assign a static IP to the camera from the DHCP server on their router. Test contributed by community member. The THETA V runs the Android OS, which is a form of Linux, which has a similar to the Windows or MacOS running on your laptop. Similar to your laptop, the THETA V can connect to the Internet using Wi-Fi, Ethernet or USB tethering to your mobile phone. 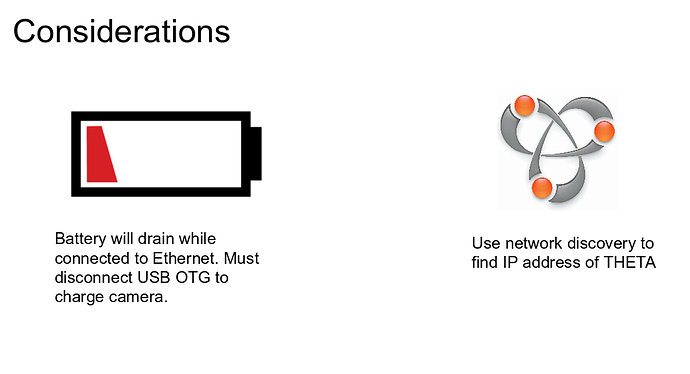 Unlike your laptop, the USB port in your THETA V usually acts as a USB storage device. 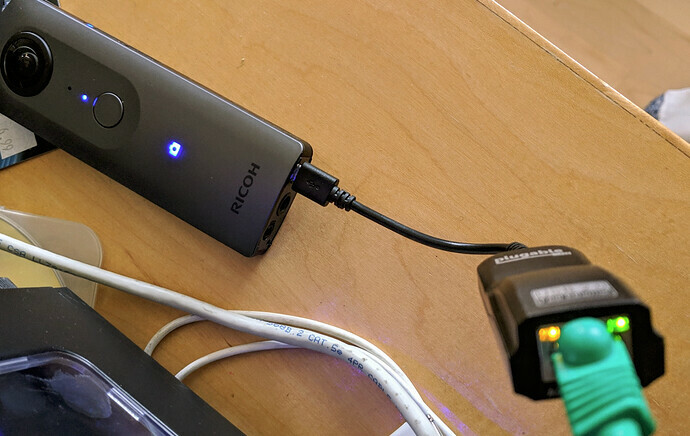 To enable the THETA V to work as a USB host, you need a USB OTG device. Once connected to Ethernet, the THETA V will function the same as if it were connected to Wi-Fi. As the camera battery is not charged by the USB OTG adapter, potential use is limited to applications where Wi-Fi coverage is unstable due to interference or you do not have Wi-Fi access. If you take apart the camera, it may be possible to bypass the battery and hack an external power supply onto the camera. No one has succeeded with this yet. You could be the first. With the Ethernet connection and the IP address, I can access the plug-in over Ethernet. I got the IP address from my router. After adb connect to the IP is established, Vysor came right up. Telepresence Tips for HTC Vive? 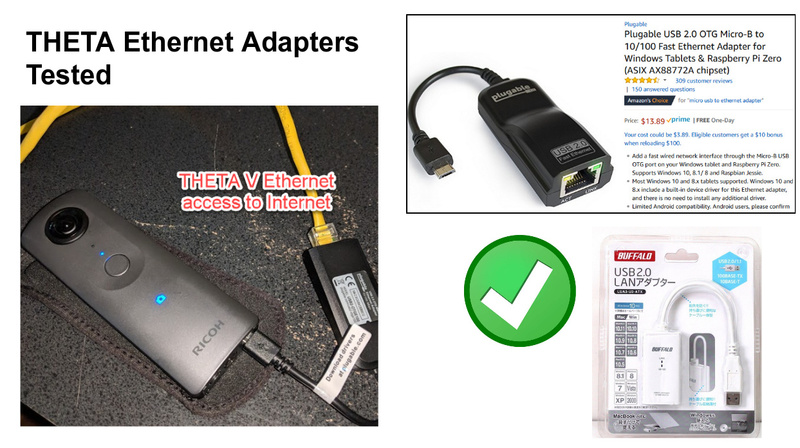 Here’s a possible use for the THETA to Ethernet connection solution. In this solution, the office has no Wi-Fi. The PC kiosk cannot send API commands to the THETA when the THETA is in access point (AP) mode because the THETA also configures itself as 192.168.1.1. This IP address is already taken by the office router. Any Ethernet adapter could work. We’ve tested the two adapters shown below. They work without any additional software. 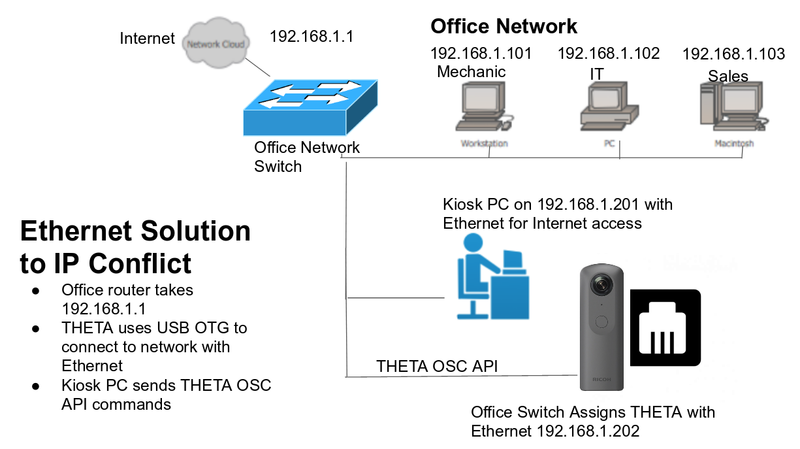 Just plug the adapter in and the THETA will get assigned an IP address by your office DHCP server. 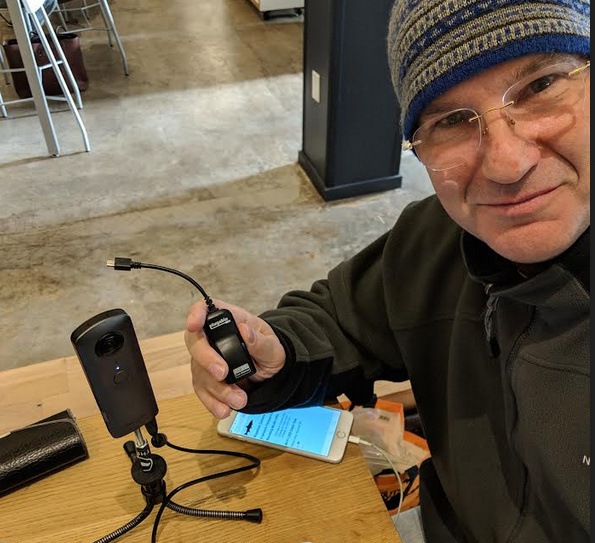 The THETA will not charge while it is connected with USB OTG. You will need to disconnect the THETA from Ethernet and plug it into a USB charger to charge the battery. 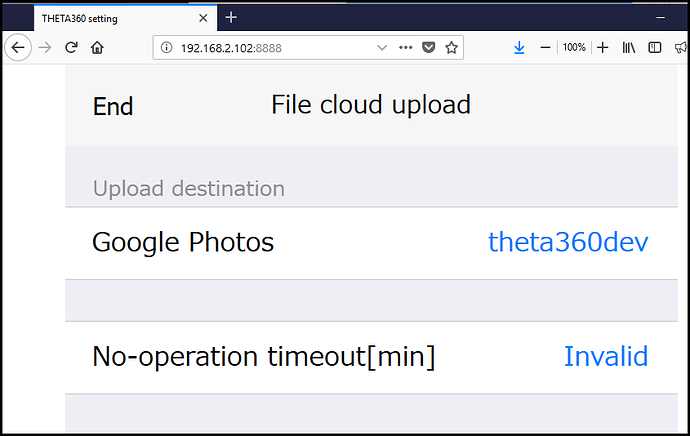 Your application can disovery the IP address of the THETA through DNS-SD. Here is one example. I have a question about the Vysor test over ethernet. I’ve tried using ipconfig, and downloading a DHCP server, but neither have been giving me the IP (I may have used the DHCP server wrong as well). 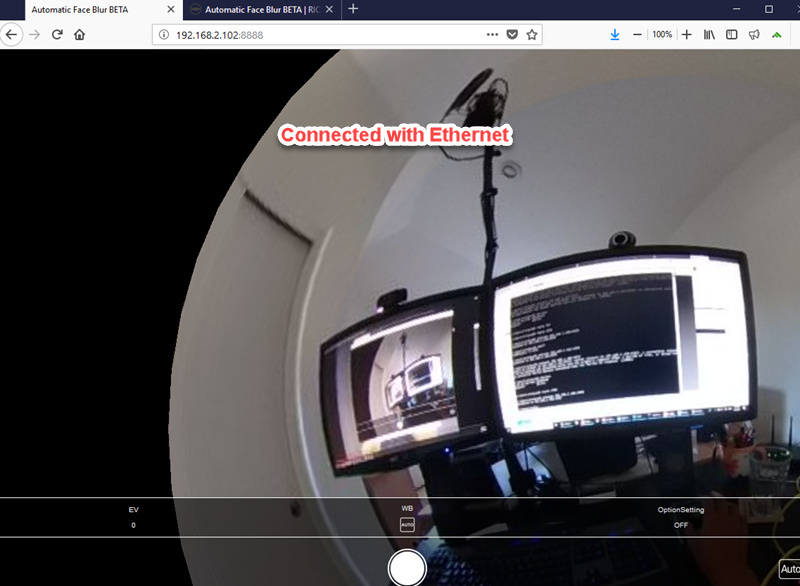 I also connected to the camera with my phone using the app and got the IP address, but i’m guessing that IP address i’m getting is the one between my phone and the camera.